Thomas Ederth has an MSc degree in Applied Physics and Electrical Engineering from the Linköping Institute of Technology. Efter a year of research at the Institute for Surface Chemistry, Stockholm (now a part of RISE), he continued to doctoral studies in Physical Chemistry at the Royal Institute of Technology (KTH), Stockholm, under the supervision of Prof Per Claesson. He graduated in 1999 with a thesis on intermolecular and surface forces. As a PostDoc at Oxford University, he was developing neutron scattering methods for characterization of foams and foam films, in the group of Dr Robert K Thomas. 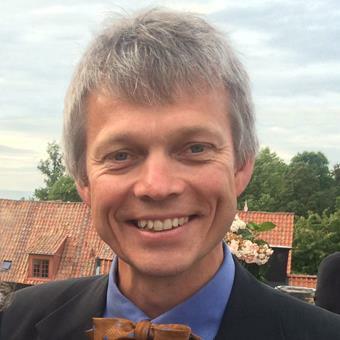 Dr Ederth spent a short time at Thin Film Electronics (Linköping) to work with polymer physics, but was recruited to the Sensor Science and Molecular Physics group at Linköping University in 2002, by Prof. Bo Liedberg. Thomas Ederth obtained a Docent degree in 2010, and is since 2012 head of the Division of Molecular Physics. W. Yandi, S. Mieszkin, M. E. Callow, J. A. Callow, J. A. Finlay, B. Liedberg, T. Ederth, "Antialgal activity of poly(2-(dimethylamino)ethyl methacrylate) (PDMAEMA) brushes against the marine alga Ulva." Biofouling, 33(2), 169-183 (2017). DOI: 10.1080/08927014.2017.1281409. S. Maleshlijski, G. H. Sendra, N. Aldred, A.S. Clare, B. Liedberg, M. Grunze, T. Ederth, A. Rosenhahn, "Imaging SPR combined with stereoscopic 3D tracking to study barnacle cyprid–surface interactions." Surface Science. 643, 172-177 (2016). DOI: 10.1016/j.susc.2015.08.027, Full text in DiVA. R. Nugraha, J. Finlay, S. Hill, T. Fyrner, W. Yandi, M. E. Callow, J. A. Callow, T. Ederth, "Antifouling properties of oligo(lactose)-based self-assembled monolayers." Biofouling. 31(1), 123-134 (2015). DOI: 10.1080/08927014.2014.1001841, Full text in DiVA. Y. Wibisono, W. Yandi, M. Golabi, R. Nugraha, E. R. Cornelissen, A. J. B. Kemperman, T. Ederth, K. Nijmeijer, "Hydrogel-coated feed spacers in two-phase flow cleaning in spiral wound membrane elements: a novel platform for eco-friendly biofouling mitigation." Water Research. 71, 171–186 (2015). DOI: 10.1016/j.watres.2014.12.030, Full text in DiVA. W. Yandi, S. Mieszkin, P. Martin-Tanchereau, M. E. Callow, J. A. Callow, L. Tyson, B. Liedberg, T. Ederth, "Hydration and chain entanglement determines the optimum thickness of poly(HEMA-co-PEG10MA) brushes for effective resistance to settlement and adhesion of marine fouling organisms." ACS Applied Materials & Interfaces, 6(14), 11448–11458 (2014). DOI: 10.1021/am502084x, Full text in DiVA. A. M. Villamil Giraldo, T. Fyrner, S. Wennmalm, A. N. Parikh, K. Öllinger, T. Ederth, "Spontaneous vesiculation and pH-induced disassembly of a lysosomotropic detergent: impacts on lysosomotropism and lysosomal delivery." Langmuir, 32(50), 13566–13575 (2016). DOI: 10.1021/acs.langmuir.6b03458. A. M. Villamil Giraldo, H. Appelqvist, T. Ederth, K. Öllinger, "Lysosomotropic agents: impact on lysosomal membrane permeabilization and cell death." Biochemical Society Transactions, 42(5), 1460–1464 (2014). DOI: 10.1042/BST20140145, Full text in DiVA. P. Nygren, M. Lundqvist, B. Liedberg, B.-H. Jonsson, T. Ederth, "Secondary structure in de novo designed peptides induced by electrostatic interaction with a lipid bilayer membrane. ", Langmuir 26(9), 6437–6448 (2010). DOI: 10.1021/la100027n, Full text in DiVA. A. Di Fino, L. Petrone, N. Aldred, T. Ederth, B. Liedberg, A.S. Clare, “Correlation between surface chemistry and settlement behaviour in barnacle cyprids (Balanus improvisus)” Biofouling, 30(2), 143-152 (2014). DOI: 10.1080/08927014.2013.852541, Full text in DiVA. T. Fyrner, H.-S. Lee, A. Mangone, T. Ekblad, M. E. Pettitt, M. E. Callow, J. A. Callow, S. L. Conlan, R. Mutton, A. S. Clare, P. Konradsson, B. Liedberg, T. Ederth, “Saccharide-functionalized alkanethiols for fouling-resistant self-assembled monolayers: Synthesis, monolayer properties and anti-fouling behaviour.”, Langmuir, 27 (24), 15034–15047 (2011). DOI: 10.1021/la202774e. E. Bittoun, A. Marmur, M. Östblom, T. Ederth, B. Liedberg, “Filled nano-porous surfaces: controlled formation and wettability.” Langmuir 25(20), 12374-12379 (2009). DOI: 10.1021/la9016992. T. Ederth, M. E. Pettitt, P. Nygren, C.-X. Du, T. Ekblad, Y. Zhou, M. Falk, M. E. Callow, J. A. Callow and B. Liedberg, “Interactions of zoospores of Ulva linza with arginine-rich oligopeptide monolayers.” Langmuir 25(16), 9375–9383 (2009). DOI: 10.1021/la900688g. M. J. Jafari, J. Liu, I. Engquist, T. Ederth, "Time-resolved chemical mapping in light-emitting electrochemical cells." ACS Applied Materials & Interfaces, 9(3), 2747–2757 (2017). DOI: 10.1021/acsami.6b14162. U. Ail, M. J. Jafari, H. Wang, T. Ederth, M. Berggren, X. Crispin, "Thermoelectric Properties of Polymeric Mixed Conductors." Advanced Functional Materials, 26(34), 6288-6296 (2016). DOI: 10.1002/adfm.201601106. L. Ouyang, C. Musumeci, M. J. Jafari, T. Ederth, O. Inganäs, "Imaging the phase separation between PEDOT and polyelectrolytes during processing of highly conductive PEDOT:PSS films." ACS Applied Materials & Interfaces7(35), 19764-19773 (2015). DOI: 10.1021/acsami.5b05439. E. Bittoun, A. Marmur, M. Östblom, T. Ederth, B. Liedberg, “Filled nano-porous surfaces: controlled formation and wettability.” Langmuir25(20), 12374-12379 (2009). DOI: 10.1021/la9016992. E. Mitraka, M. J. Jafari, M. Vagin, X. Liu, M. Fahlman, T. Ederth, M. Berggren, M. P. Jonsson, X. Crispin, "Oxygen-induced doping on reduced PEDOT". Journal of Materials Chemistry A, accepted. DOI: 10.1039/c6ta10521a. Q. Zhang, X. Liu, F. Jiao, S. Braun, M. J. Jafari, X. Crispin, T. Ederth, M. Fahlman, "Ground-state charge transfer for NIR absorption with donor/acceptor molecules: Interactions mediated via energetics and orbital symmetries". Journal of Materials Chemistry C, 5, 275–281 (2017). DOI: 10.1039/C6TC04563D. W. Yandi, S. Mieszkin, A. Di Fino, P. Martin-Tanchereau, M. E. Callow, J. A. Callow, L. Tyson, A. S. Clare, T. Ederth, "Charged hydrophilic polymer brushes and their relevance for understanding marine biofouling." Biofouling, 32(6), 609-625 (2016). DOI: 10.1080/08927014.2016.1170816. Z. U. Khan, O. Bubnova, M. J. Jafari, R. Brooke, X. Liu, R. Gabrielsson, T. Ederth, D. R. Evans, J. W. Andreasen, M. Fahlman and Xavier Crispin, "Acido-basic control of the thermoelectric properties of poly(3,4-ethylenedioxythiophene)tosylate (PEDOT-Tos) thin films." Journal of Materials Chemistry C, 3, 10616-10623 (2015). DOI: 10.1039/C5TC01952D. L. Ouyang, C. Musumeci, M. J. Jafari, T. Ederth, O. Inganäs, "Imaging the phase separation between PEDOT and polyelectrolytes during processing of highly conductive PEDOT:PSS films." ACS Applied Materials & Interfaces 7(35), 19764-19773 (2015). DOI: 10.1021/acsami.5b05439. F. A. Ajjan, M. J. Jafari, T. Rebis, T. Ederth, O. Inganäs, "Spectroelectrochemical investigation of redox states in a polypyrrole/lignin composite electrode material." Journal of Materials Chemistry A. 3, 12927-12937 (2015). DOI: 10.1039/C5TA00788G. S. M. Vater, J. Finlay, M. E. Callow, J. A. Callow, T. Ederth, B. Liedberg, M. Grunze, A. Rosenhahn, "Holographic microscopy provides new insights into the settlement process of zoospores of Ulva linza on charged oligopeptide surfaces." Biofouling. 31(2), 229-239 (2015) DOI: 10.1080/08927014.2015.1022534. L. Petrone, N. Aldred, K. Emami, K. Enander, T. Ederth, A. S. Clare, "Chemistry-specific surface adsorption of the barnacle settlement-inducing protein complex (SIPC)." Royal Society Interface Focus, 5(1), 20140047 (2015). DOI: 10.1098/rsfs.2014.0047, Full text in DiVA. F.-I Tai, O. Sterner, O. Andersson, T. Ekblad and T. Ederth, “pH-control of the protein resistance of thin hydrogel gradient films.” Soft Matter, 10, 5955-5964 (2014). DOI: 10.1039/C4SM00833B, Full text in DiVA. Z. Tang, W. Tress, Q. Bao, M. J. Jafari, J. Bergqvist, T. Ederth, M. R. Andersson, O. Inganäs. “Improving cathodes with a polymer interlayer in reversed organic solar cells.” Advanced Energy Materials, 4(15), 1400643 (2014). DOI: 10.1002/aenm.201400643. N. Aldred, N. V. Gohad, L. Petrone, B. Orihuela, B. Liedberg, T. Ederth, A. Mount, D. Rittschof and A. S. Clare, “Confocal microscopy-based goniometry of barnacle cyprid permanent adhesive” The Journal of Experimental Biology, 216 (11) 1969-1972 (2013). DOI: 10.1242/jeb.084913. T. Fyrner, T. Ederth, D. Aili, B. Liedberg, P. Konradsson, “Synthesis of oligo(lactose)-based thiols and their self-assembly onto gold surfaces” Colloids and Surfaces B: Biointerfaces 105, 187-193 (2013). DOI: 10.1016/j.colsurfb.2013.01.002, Full text in DiVA. S. Suriyanarayanan, L. Petrone, T. Ederth, I. A. Nicholls, “Biotinyl moiety-selective polymer films with highly ordered macropores” Chemical Communications 49 (46), 5274-5276 (2013). DOI: 10.1039/c3cc42235f. T. Ederth, T. Ekblad, M. E. Pettitt, S. L. Conlan, C.-X. Du, M. E. Callow, J. A. Callow, R. Mutton, A. S. Clare, F. D’Souza, G. Donnelly, A. Bruin, P. R. Willemsen, X. Su, S. Wang, Q. Zhao, M. Hederos, P. Konradsson, B. Lieberg, "Resistance of galactoside-terminated alkanethiol self-assembled monolayers to marine fouling organisms", ACS Applied Materials & Interfaces 3(10), 3890–3901 (2011). DOI: 10.1021/am200726a. L. Petrone, A. Di Fino, N. Aldred, P. Sukkaew, T. Ederth, A. S. Clare, B. Liedberg, “Effects of surface charge and Gibbs surface energy on the settlement behaviour of barnacle cyprids (Balanus amphitrite)”, Biofouling, 27(9), 1043-1055 (2011). DOI: 10.1080/08927014.2011.625474. T. Ekblad, O. Andersson, F.-I Tai, T. Ederth and B. Liedberg, “Lateral control of protein adsorption on charged polymer gradients.” Langmuir 25(6), 3755-3762 (2009). DOI: 10.1021/la803443d. T. Ekblad, G. Bergström, T. Ederth, S.L. Conlan, R. Mutton, A.S. Clare, S. Wang, Y. Liu, Q. Zhao, F. D'Souza, G.T. Donnelly, P.R. Willemsen, M.E. Pettitt, M.E. Callow, J.A. Callow, B. Liedberg, “Poly(ethylene glycol)-containing hydrogel surfaces for antifouling applications in marine and freshwater environments.” Biomacromolecules 9(10), 2775-2783 (2008). DOI: 10.1021/bm800547m. T. Ederth, P. Nygren, M.E. Pettitt, M. Östblom, C.-X. Du, K. Broo, M. E. Callow, J. Callow, B. Liedberg, "Anomalous settlement behavior of Ulva linza zoospores on cationic oligopeptide surfaces." Biofouling 24(4), 303–312 (2008). DOI: 10.1080/08927010802192650. G. Klenkar, B. Brian, T. Ederth, G. Stengel, F. Höök, J. Piehler J, B. Liedberg, “Addressable adsorption of lipid vesicles and subsequent protein interaction studies.” Biointerphases 3(2), 29-37 (2008). DOI: 10.1116/1.2921867. A. Rosenhahn, T. Ederth, M.E. Pettitt, “Advanced nanostructures for the control of biofouling: The FP6 EU integrated project AMBIO”. Biointerphases 3(1), IR1-IR5 (2008). DOI: 10.1116/1.2844718. X. Wang, T. Ederth and O Inganäs, "In situ Wilhelmy balance surface energy determination of poly(3-hexylthiophene) and poly(3,4-ethylenedioxythiophene) during electrochemical doping-dedoping." Langmuir 22(22), 9287-9294 (2006). DOI: 10.1021/la061606p. Erratum: Langmuir 23(7), 4102-4102 (2007). DOI: 10.1021/la7004979. T. Ederth and R. K. Thomas, “A neutron reflectivity study of drainage and stratification of AOT foam films”. Langmuir 19(19), 7727 (2003). DOI: 10.1021/la0267286. T. Ederth, “Computation of Lifshitz-van der Waals forces between alkylthiol monolayers on gold films”. Langmuir 17(11), 3329 (2001). DOI: 10.1021/la001607w. T. Ederth, K. Tamada, P. M. Claesson, R. Valiokas, R. Colorado Jr., M. Graupe, O. E. Shmakova, and T. R. Lee, “Force measurements between semifluorinated thiolate self-assembled monolayers: Long-range hydrophobic interactions and surface charge.” Journal of Colloid and Interface Science 235(2), 391-397 (2001). DOI: 10.1006/jcis.2000.7318. T. Ederth, “Template-stripped gold surfaces with 0.4 nm rms roughness suitable for force measurements. Application to the Casimir force in the 20-100 nm range.” Physical Review A 62, 62104 (2000). DOI: 10.1103/PhysRevA.62.062104. T. Ederth, “Substrate and solution effects on the long-range “hydrophobic” interactions between hydrophobized gold surfaces.” The Journal of Physical Chemistry B 104 (41), 9704-9712 (2000). DOI: 10.1021/jp002052g. F. Tiberg, T. Ederth, “Interfacial properties of non-ionic surfactants and decane-surfactant microemulsions at the silica-water interface. An ellipsometry and surface force study.” The Journal of Physical Chemistry B 104 (41), 9689-9695 (2000). DOI: 10.1021/jp0019106. L. Grant, T. Ederth, F. Tiberg, “Influence of surface hydrophobicity on the layer properties of adsorbed non-ionic surfactants.” Langmuir 16 (5), 2285-2291 (2000). DOI: 10.1021/la990700l. T. Ederth, P. M. Claesson, “Forces between carboxylic acid surfaces in divalent electrolyte solutions”. Journal of Colloid and Interface Science 229 (1), 123-128 (2000). DOI: 10.1006/jcis.2000.6961. T. Ederth, B. Liedberg, “The influence of wetting properties on the long-range “hydrophobic” interaction between self-assembled alkylthiolate monolayers.” Langmuir 16 (5), 2177-2148 (2000). DOI: 10.1021/la9909650. F.-J. Schmitt, T. Ederth, P. Weidenhammer, P. M. Claesson, H.-J. Jacobasch, “Direct force measurements on bulk polystyrene using the bimorph surface forces apparatus”, Journal of Adhesion Science and Technology 13 (1), 79-96 (1999). DOI: 10.1163/156856199X00316. J. C. Fröberg, T. Ederth, “On the possibility of glue contaminations in the surface force apparatus”, Journal of Colloid and Interface Science 210 (1), 215-217 (1999). DOI: 10.1006/jcis.1998.5935. T. Ederth, P. M. Claesson, B. Liedberg, “Self-assembled monolayers of alkanethiolates on thin gold films as substrates for surface force measurements. Long-range hydrophobic interactions and electrostatic double-layer interactions”, Langmuir 14 (17), 4782-4789 (1998). DOI: 10.1021/la9801312. P. M. Claesson, T. Ederth, V. Bergeron, M. W. Rutland, “Techniques for measuring surface forces”, Advances in Colloid and Interface Science 67, 119-184 (1996). DOI: 10.1016/0001-8686(96)00302-8. I. Lundstrom, T. Ederth, H. Kariis, H. Sundgren, A. Spetz, F. Winquist, “Recent developments in field-effect gas sensors”, Sensors and Actuators B: Chemical 23(2-3), 127-134 (1995). DOI: 10.1016/0925-4005(94)01280-U.